Je Tsongkapa (1357-1419), also known as Je Rinpoche Lobsang Drakpa, was perhaps the single greatest commentator in the 2,500 year history of Buddhism. He was born in the district of Tsongka in eastern Tibet, and took his first vows at a tender age. As a teenager he had already mastered much of the teachings of Buddhism, and was sent by his tutors to study at the great monastic universities of Central Tibet. Here he studied under the leading Buddhist scholars of his day; it is said as well that he enjoyed mystic visions in which he met and learned from the different forms of the Buddha himself. The 18 volumes of Tsongkapa’s collected works contain eloquent and incisive commentaries on virtually every major classic of ancient Buddhism, as well as his famous treatises on the “Steps of the Path to Buddhahood.” His students, who included the first Dalai Lama of Tibet, contributed hundreds of their own expositions of Buddhist philosophy and practice. All of the teachings in the ACI archives are derived directly or indirectly from his writings and those of his students. Khen Rinpoche Geshe Lobsang Tharchin (1921 - 2004) was born in Lhasa, Tibet, and he entered Sera Monastery there at an early age. He successfully completed the rigorous 25-year program studying under great teachers directly in the lineage of Je Tsongkapa. After his final public examination by the best scholars of the day, Rinpoche was awarded the highest degree of Hlarampa Geshe (doctor of philosophy), and he graduated with the highest honors in his class of 10,000 monks. Khen Rinpoche came to the United States in 1972 and became Abbot of Rashi Gempil Ling Temple in New Jersey. After going to South India in 1991 and serving as Abbot of Sera Mey monastery for some time, he returned to the United States. Khen Rinpoche Geshe Lobsang Tharchin was a lifetime director and an abbot emeritus of Sera Mey monastery, as well as founder of the Mahayana Sutra and Tantra Center, which has branches in New Jersey and Washington, DC. He was also the spiritual director of the Asian Classics Institute and the Asian Classics Input Project. Geshe Michael Roach (1952-present) grew up in Phoenix, Arizona, where he was an honors student with an interest in religion and social issues. He was awarded a scholarship to Princeton University and after graduation he went to study and live at Rashi Gempil Ling, with Khen Rinpoche Geshe Lobsang Tharchin. 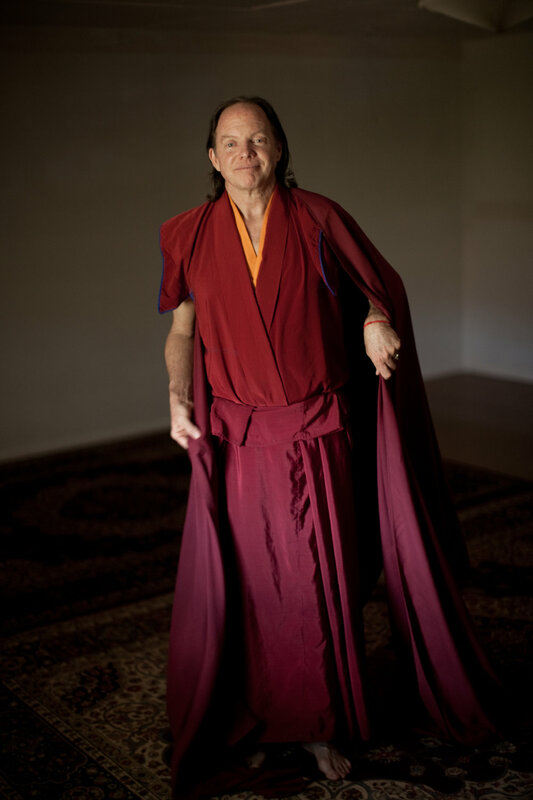 In 1995 he completed his studies with Khen Rinpoche and at Sera Monastery in India, and became the first American to be awarded the Geshe degree. While completing this work, he also developed and taught the seven-year Formal Study Program, which parallels the same core information taught at the Tibetan Buddhist monastery. That original program of 18 courses captures the essence of the six Great Books of Buddhism, as a means to train the next generations of western Buddhist teachers. Asian Classics Institute began with the mission to provide the recordings online, live teachings and by correspondence for anyone who would like to pursue these studies. In addition to his work with Diamond Cutter Institute, whose aim is to present the core teachings of Buddhism in a more universal presentation, Geshe Michael continues to translate and to teach Buddhist texts to many different audiences, in many facets. It is the aim of Asian Classics Institute to continue to make this material and teachings available to improve the lives of people in our communities and throughout the world.